While we all have access to today’s great technology, it is truly only worth what we make of it. Without proper implementation, each device is only a different sized paperweight. 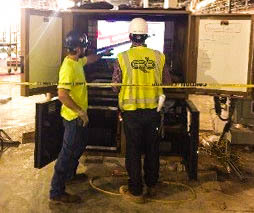 CRB utilizes iPhones, iPads, numerous applications and VDC kiosks in the field in order to drastically improve collaboration, installation and safety during the construction processes. This gives our construction engineers, superintendents and trade contractors the resources necessary to stay on-site. Traditional workflows required field teams to make trips back and forth from the site to the construction trailers or design center to examine drawings, file reports or make minor changes. CRB implements limitless technology in each and every project to improve our overall construction process and ensure that safety remains a top priority. CRB’s project teams are equipped with iPhones and iPads to stay connected to the most recent project documentation, schematics, blue prints, drawings and inspection tools. Applications allow users to access 3-dimensional building models, electronic stick sets and inspection forms, making all components instantly available with a click of a button. This gives CRB’s project team the information required to perform inspections and audits in order to verify that work is installed per the design intent and executed safely. The Bluebeam app is equipped with Bluebeam Studio which allows for real-time markup access between CRB’s design team and those working in the field. The Studio session is cloud-based; both design and construction teams have access to the cloud from their iPads or computers. Users can upload and share an unlimited number of PDFs and any other file types so that project partners can be working on the same document concurrently. Diagrams and images can be added to the PDF to accurately communicate issues and quicken resolution time. Bluebeam can be utilized even in the case of no internet access therefore minimizing lost time. The SafetyNet application makes inspections easy to perform and feeds results into a project database so CRB’s project team can quickly recognize trends. For example, if multiple reports were filed of incidents involving noncompliance with personal protection equipment (PPE) on-site, CRB would be alerted of the issue and could address it immediately. Traditionally, noncompliance paperwork would have to follow a trail and risk being lost in piles of forms. Safety issues ranked above “medium” are transmitted via text and image to CRB decision makers in real-time for swift correction. Accountability is enforced as the identifying person must log back into the system to physically change the status from “not corrected” to “corrected.” Issues are resolved rather than forgotten easing rigorous inspections. SafetyNet permits all users to share information across multiple job sites throughout the country. This is crucial for preventing potential errors and identifying training needs. Online audits keep CRB in compliance with federal regulations. CRB’s clients have access to monthly reports demonstrating how CRB takes safety seriously. SafetyNet is a vital tool that ensures all workers have a protected work environment with minimized risk. This application allows the iPad users to have the entire BIM model at their fingertips. The user can click on any object and view all of the item’s properties. For example, by tapping on an air handling unit, the user can view sizing and utility requirements associated with the equipment. By simply touching, accurate measurements of all elements in the model are efficiently obtained. There is also a free view mode which allows the users to hold the iPad up and as they move, the model will move to the wall in the direction they are facing. CRB’s team can quickly verify that all items have been installed in the right location. Bookmark views are created so users can select the room in which they are standing and the model will automatically jump to their location. In addition, all the information in the design intent model is accessible through the app. ISNetworld is an online management and record keeping database which ensures that contractors meet internal and governmental compliance requirements. ISN collects health, safety, procurement, quality and regulatory information. CRB’s strict safety requirements for contractors are entered into ISN. Likewise, a contractor submits his or her information to ISN for a comprehensive review of EMR, OSHA Logs, Insurance Certificates and the safety manual. These items are audited by ISN to make sure they meet the minimum standards of CRB. The contractor receives a grade of A, B, C or F. Auditors work with contractors to build their safety program to meet CRB requirements. An added benefit is that CRB can request and solicit work from a contractor who is already approved. ISNetworld’s free mobile app enables CRB to obtain contractor information while in the field. If a CRB employee witnesses a contractor breaking a rule, CRB can instantly ascertain whether or not workers have received proper training. Using any device’s camera, one can simply scan a contractor’s ISN identification card to access an individual’s qualifications even prior to being allowed on-site. A VDC Kiosk is a powerful tool that enables all trades to have access to models, drawings and electronic file management systems in the field. All documents pertaining to the project remain accessible throughout execution. In addition to the obvious convenience, the use of kiosks streamlines processes, coordinates functions, facilitates clear communication and eliminates costly mistakes. With video conferencing capabilities, the field team can conduct virtual meetings and discuss issues with off-site design staff; this reduces the need for RFIs. Coordination issues that might have arisen previously are usually prevented and conveniently solved. Having the technology at our disposal is important; using the technology effectively is what sets CRB apart from the competition. With accessible documentation, smooth construction workflows, and improved traditional inspections, the process of your project is streamlined. Technology assists CRB’s teams to manage projects wherever they may be, at any time and on any device. The work is done more efficiently producing quality results every time without compromising safety. CRB has incorporated multiple technologies in the field to prevent and solve coordination and safety issues in a real-time environment, thus alleviating obstacles and ultimately saving our valued clients time and money. Technology is working for CRB. Matt Edwards is a BIM Specialist at CRB in our Raleigh, North Carolina office. How Can Matt Edwards Help?